Ah, the joys of modern living. An email with this subject header was waiting for me in my spam folder this morning: "FBI OFFICE GET BACK TO US IMMEDIATELY IF YOU DONT WANT US TO ARREST YOU AND JAIL YOU FOR YOUR OWN G0OD." Do people actually fall for this? As much as I am constantly complaining about how full my freezer is, there is something to be said for having a little bit of everything in there for those days when you have nothing in the house and need to whip up something fast and easy. I had a wonderful long weekend in Austin, but I could already tell I was coming down with something potentially virile on my way home from the airport. I had purposely worked my way down to the bare essentials in the kitchen the week before, taking advantage of the opportunity to clear out my refrigerator, so I did not have much and knew I was not going to up for a full-on visit to the grocery store. Instead, I toted my carry-on bag and backpack into Treasure Island and picked up a few things I knew I needed (milk), a thing or two I knew I wanted (chicken salad, sourdough bread, and - yes - ice cream), and a lovely bunch of rapini that was on sale. I figured I could put together a quick pasta dish and the rapini would be easy to prep and quick to cook. 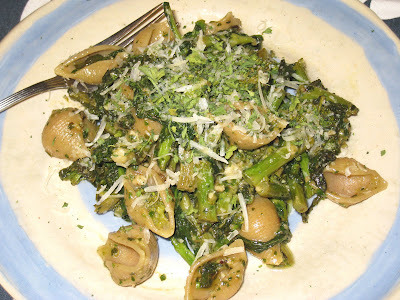 I have only used rapini once or twice before, and I know that it can be bitter, which I used to hate. I had a low tolerance for it, maybe because my mother had a high tolerance for it and whenever I would complain that something was bitter she would take a bite of it, chew reflectively for a minute, and proclaim definitively that there was nothing wrong with whatever it was at all, and I would have to do my best to force it down. Ah, memories. Now I find that I like a little bitterness in my food. Not too much, mind you, but some. And rapini has a lovely pungent bitterness, due most likely to its relation to mustard. A little honey or sugar could help offset the bitterness factor, but I find these days that a dash or two of red wine vinegar works just as well and freshens it up enough to offset the bitterness without adding sweet. While I was thinking about the quickest way to prepare it, I remembered all of those little jars of pesto I had put away over the past few months for future use. What could be more simple? Pasta shells on the larger side (but not the huge ones) seemed ideal for catching the pasta. With little thought and ingredients I already had on hand, I was able to make a delicious dinner, with enough left over for a couple of lunches. Just what I needed to get me through a few days of not feeling like cooking. You don't really need a recipe for this, but I can tell you what I did. Wash and trim a bunch of rapini and give it a rough chop. While bringing water to boil in a 3-quart saucepan, heat 3-4 tablespoons of olive oil in a large skillet over medium-high heat. Add 1 teaspoon of fennel seeds and cook for 1 minute. Add 1/4 teaspoon crushed red pepper flakes and cook for about 30 more seconds. Add 4 cloves of chopped garlic and lower the heat to medium-low. Cook the garlic for a few minutes. Add the rapini and cook, stirring frequently, for about 5 minutes, until the greens have started to wilt. If the water is not boiling yet, reduce the heat under the skillet so there is just enough heat to keep the rapini warm without overcooking it. When the water is boiling, add a heaping tablespoon of salt and then add 1-1/2 cups of medium-sized shell whole wheat pasta. Cook according to package directions, but remove from the water 1 minute earlier than instructed. Save some pasta water to thin the sauce if necessary. If you had to lower the heat under the skillet, raise it back to medium-high and add a tablespoon of red wine vinegar to the rapini, then the pasta. Cook for about 1 minute, adding pasta water if the mixture looks too tight. When the pasta is ready, remove from the heat and stir in about 1/4 a cup of pesto and 1/4 a cup of grated parmesan or pecorino cheese. Add more pasta water if necessary. Garnish with parsley and more cheese, if desired.